Finally, in 2008, a DVD with a worthy version of this modern classic novel was released. 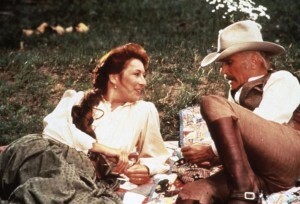 Although Lonesome Dove was made for television in the late 1980s, it was apparently filmed with a large budget in a widescreen format, as now shown on the 2008 DVD. And the new transfer was of a significantly better, clearer quality than earlier releases. One result is that this version gives a greater sense of the visual sweep and power of the American west than its more limited predecessors. 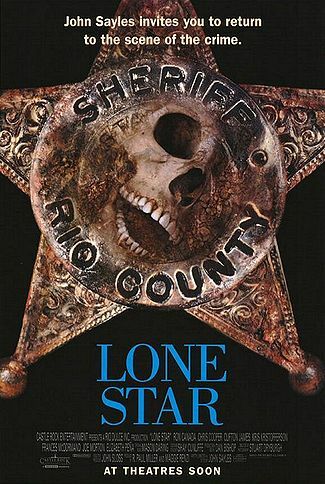 The spine of Lonesome Dove is the story of a cattle drive from Texas border country on the Rio Grande north to Montana, but it includes so much more: Indians and renegades, scurrilous buffalo hunters and rough cowhands, romances current and past, outlaws and old friends gone wrong, Texas rangers and Mexican rustlers, battles against evildoers, miscreants, Indians and the elements. Based on one of the greatest American novels of the 20th century, it takes the time to do justice to its rich source material. How can the greatest western be something made for television? It was the coming together of so many elements, including the rich and sprawling story, terrific cinematography, excellent music (by Basil Pouledoris), masterful direction, superb casting, and, perhaps most of all, the time to tell the story fully at its own pace and develop the characters. Capt. Augustus McCrae (Robert Duvall) and Capt. Woodrow Call (Tommy Lee Jones). And the cast! The casting is magnificent. 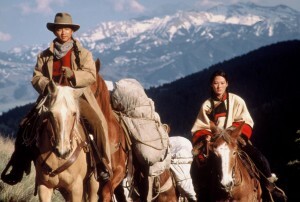 Some of the excellent cast members (Anjelica Huston, Diane Lane) are known best for their work in non-western films. 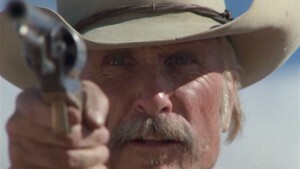 Others (Robert Duvall, Tommy Lee Jones, Chris Cooper) are icons well known from other westerns on this list. 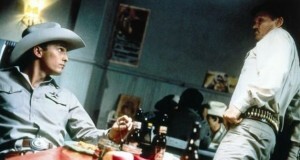 Duvall is so good as romantic former Texas Ranger Gus McCrae that it is now impossible to think of anybody else in the role, although a younger McCrae has been played by others since. Originally, James Garner was to have played Gus, but had to drop out for health reasons; he played Woodrow Call very creditably in the sequel Streets of Laredo miniseries. Tommy Lee Jones, who is actually younger than Duvall, nevertheless matches him well as the unyielding, steel-spined Captain Woodrow Call. Anjelica Huston as McCrae’s lifelong love Clara has one of the most memorable roles of her career, as does Diane Lane as the prostitute Lorena. Danny Glover as the scout Deets is terrific. It’s still strange to think of Frederick Forrest as the enigmatic but thoroughly evil Comanche Blue Duck, but even that bit of casting works. Chris Cooper, in one of his first major roles, is oddly and quietly impressive as July Johnson, drawn out of a quiet life in Arkansas and thrust into the epic struggles around McCrae and Call. There are vivid scenes that come to mind, and everyone has his favorites: the death of a drover in a river filled with snakes, McCrae’s relentless pursuit of the elusive Blue Duck (who appears mysteriously and memorably in a flash of lightning), the hanging of an old friend gone wrong, Call decisively taking on the U.S. cavalry without hesitation (“I can’t abide rude behavior in a man”), McCrae and Clara trying to work out an old love, July Johnson coping with death and with the continuation of life, and Call’s inability to claim an important relationship, are only some. Some things get resolved, and some seem not to; that’s life, and sometimes death. It has an air of authenticity. It stays with you. McCrae looks for a lost love with Clara (Anjelica Huston). The McCrae-Call partnership around which this story revolves was loosely based on the Oliver Loving-Charlie Goodnight relationship from the 1860s; they’re the Texas pair who blazed the Goodnight-Loving Trail. This version of the story was so powerful that it generated three more long novels (one sequel and two prequels) with the same characters from author Larry McMurtry. None of those matches the novel on which this was based. The others tend to get more sidetracked in the dark, the quirky and the wildly idiosyncratic, losing their grip on the themes and story that give the Pulitzer Prize-winning Lonesome Dove its powerful narrative thrust. Some of them have been made into watchable miniseries themselves (Streets of Laredo, Comanche Moon), but none of them works as well as this original on the page or on screen. The story of Lonesome Dove seems complete in itself, despite McMurtry’s insistence on giving more of it less compellingly in other novels. As for made-for-television sequels not based on McMurtry novels, such as Return to Lonesome Dove, watch them at your own peril. This was the first large-scale directing effort by Australian Simon Wincer, who has gone on to make both theatrical releases (Quigley Down Under) and excellent made-for-television westerns (Last Stand at Sabre River, Monte Walsh), including the Lonesome Dove prequel Comanche Moon. He got it right the first time. 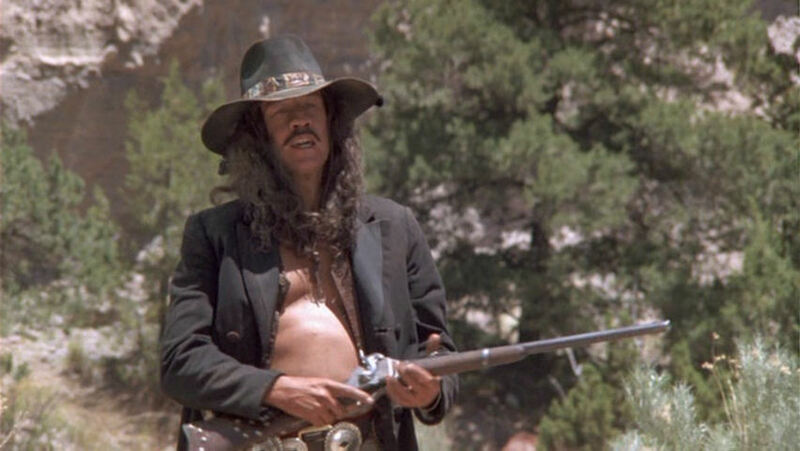 Blue Duck (Frederick Forrest), the worst of the bad guys, although there are a number to choose from. 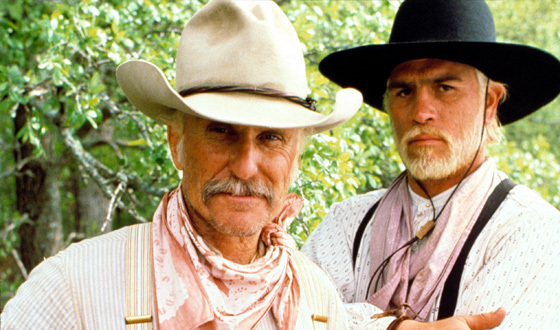 Lonesome Dove and one other are often cited as the best miniseries ever, and their proponents tend to divide along gender lines. The other is the BBC’s Pride and Prejudice (the 1995 Colin Firth and Jennifer Ehle version), and you can guess who likes which. They’re both great, but only one of them is a western. This entry was posted in 55 Greatest Westerns and tagged Cattle Drives, Chris Cooper, Made for Television, Native Americans (Indians), Robert Duvall, Simon Wincer, Tommy Lee Jones on August 9, 2013 by Nicholas Chennault. This is a small movie—one with a limited budget and without major stars at the time it was made—and it’s not available on DVD, so many people haven’t seen it. Based on a novel by Ruthannne Lum McCunn, it’s a more or less true story of how China Polly and Charlie Bemis meet in an Idaho mining camp, and what follows from that meeting. There are, strangely enough for a western, no gunfights, but there is a lot of gambling and anti-Chinese prejudice. Lalu (Rosalind Chao) is sold by her impoverished family in China and is transported to San Francisco and then to a mining town in northern Idaho, where she has become the property of Hong King (Michael Paul Chan). Hong King runs the local saloon and gambling den, which he rents from Charlie Bemis (Chris Cooper); he can’t own it since he isn’t a citizen and isn’t allowed to become one. A constant element of the background is the racist treatment of the numerous Chinese. Charlie himself, though not Chinese, appears to be on an extended streak of bad luck. 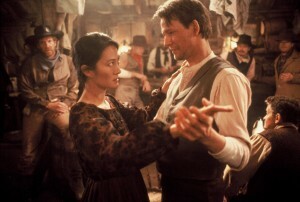 Everybody refers to Lalu as China Polly, and Hong King intends to sell her sexual favors in a back room of the saloon. With the help of a knife, she persuades him that this would not be a good course to take, and she earns her keep with more socially acceptable forms of hard work. Eventually, Charlie wins her from Hong King in a poker game, and she repays Charlie by nursing him back to health after Charlie receives a serious wound. He’d like a permanent relationship with her, but she’s adamant that she intends to return to her family in China. By the end of the movie, however, the Chinese are driven out of the mining camp, and China Polly decides her real home is with Charlie. The real-life Bemises established a homestead together on Idaho’s romantically named River of No Return. Polly (Rosalind Chao) and Charlie (Chris Cooper) dance warily. At heart, this is a romance with a western setting. It is also the only one of the great westerns directed by a woman. It is slower-paced than many westerns, but it seems true to its time and place. It’s surprising how many really good westerns of the last 20 years have featured Cooper, an otherwise not-terribly-well-known or flashy actor. 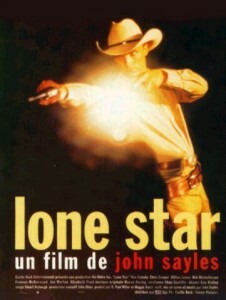 (See Lone Star and Lonesome Dove, for example.) He’s understated, and he’s good. And Rosalind Chao is excellent as Lalu/China Polly; she is the central figure and really makes the movie work. It was filmed in the old mining town of Butte, Montana. It’s not on DVD, but it’s worth seeking out wherever you can find it. Just be aware that it focuses more on relationships and less on action than most westerns do. If this movie leaves you wanting to know more about the real China Polly and Charlie Bemis, check out The Poker Bride by Christopher Corbett (New York: Atlantic Monthly Press, 2010). For another great western featuring the Chinese in the American west, try Broken Trail, above. This entry was posted in 55 Greatest Westerns and tagged Chinese, Chris Cooper, Mining Camps on August 6, 2013 by Nicholas Chennault. 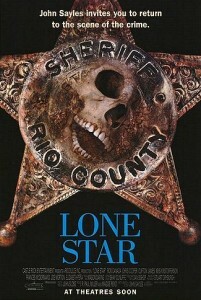 The central character is Rio County sheriff Sam Deeds (Chris Cooper) in modern-day Texas. Sam is grappling with personal and professional (but mostly personal) issues relating to his own legendary-but-now-deceased sheriff father Buddy Deeds (played as a young man in flashbacks by Matthew McConaughey) and Charlie Wade, Buddy’s brutal and corrupt but effective predecessor (Kris Kristofferson) as sheriff. However, there are also multigenerational issues involving Latinos and blacks, as well as the area’s changing demographics. These are all played out against a background of finding and identifying a body in the desert, dead for decades and reduced to bones. It’s a rich canvas, focusing on several families with different backgrounds and weaving them together with the central story. The quiet use of the changing ethnic mix of Texas, with the conflicts between generations, is never heavy-handed and seldom predictable. In addition to dealing with the heritage of the western mythos in the person of his father (who was apparently more successful as a lawman than as a father), Sam copes with his own ethical and relationship dilemmas. He’s divorced and becomes interested in renewing a relationship with Pilar Cruz (Elizabeth Pena), his Latina high school girl friend. Pilar, now a high school history teacher, has some issues with her own mother Mercedes, a widow who runs a successful Mexican restaurant. Fort McKenzie, the local army base, is slated to be closed. The new camp commander, Col. Delmore Payne (Joe Morton), is a hard-line military type trying keep his command in shape while juggling his feelings about his estranged father Otis (Ron Canada) and his own adolescent son who’s chafing under his military father’s restrictions. Otis runs Big O’s, the only bar in the county primarily for blacks. While Sam investigates past sheriffs Buddy and Charlie and digs up old secrets, he tries to figure out if he wants to run for sheriff again when the much more numerous Latinos get political power in the next election. Buddy could be as controlling as Charlie—it was part of the job description for a sheriff in border country—but was he as corrupt? Some of the investigation involves Pilar’s family, too, and the Paynes. Sam and Pilar hit it off as well as they did when they were teenagers. Eventually he finds the truth about the body and some about his father, as well. Two former sheriffs of Rio County face off. The cast is surprisingly good, especially the understated Cooper, Elizabeth Pena, Ron Canada and Joe Morton. Even Matthew McConaughey is good in this (albeit with little actual screen time), which must mean that the story and director are unusually excellent. The smaller characters, like Clifton James who plays a former Wade deputy who’s now the town’s mayor, are quite good, too. Frances McDormand has a very good cameo as Sam’s ex-wife, who’s “wound a little too tight.” There’s a deliberate pace to the development and a focus on relationships, with a little action interspersed. In the occasional flashback, the camera pans seamlessly from the present to the past to start the flashback, or from the past to the present at the end in an interesting technique. This entry was posted in 55 Greatest Westerns and tagged Chris Cooper, Modern West, Westerns Noir on July 30, 2013 by Nicholas Chennault.